Editors: A Spanish version of this news release is also available. MEXICO CITY -- With Indiana in the midst of a substantial increase in its Latino population -- which is having a major effect on the growth of the state's economic enterprise -- Indiana University is strengthening its engagement with one of Latin America's largest, most dynamic and most culturally vibrant countries. 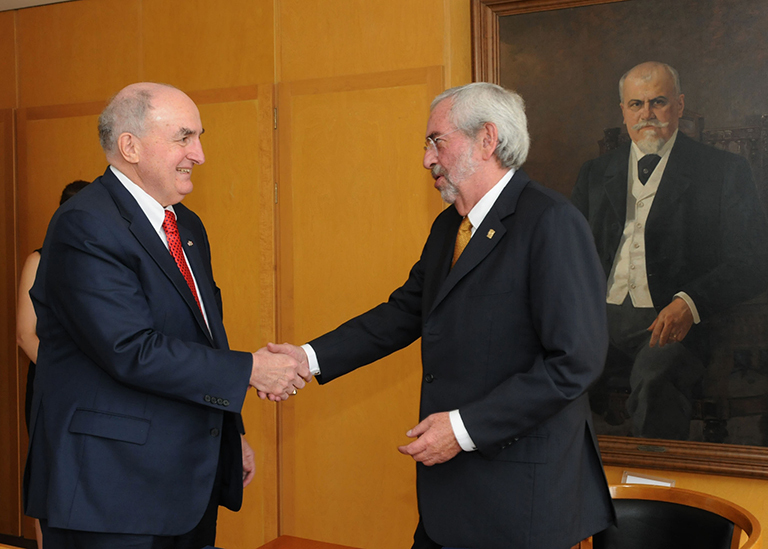 A university delegation led by IU President Michael A. McRobbie met with faculty and senior administrators, including President Enrique Graue Wiechers, this week at the National Autonomous University of Mexico, or UNAM, the largest university in Latin America and a leading university of the Spanish-speaking world. The meeting resulted in an agreement to explore further areas of collaboration between the two institutions, which have had a successful relationship for nearly two decades. IU has had a formal partnership with UNAM, one of only a few university campuses in the world designated as a UNESCO World Heritage site, since 2013. But IU's relationship with UNAM dates back to 1999, when collaboration began between the university and the Ostrom Workshop in Political Theory and Policy Analysis at IU. The workshop was co-founded in 1973 by the late Nobel Prize-winning economist and IU Distinguished Professor Elinor Ostrom. While in Mexico City, the IU leaders met with U.S. Ambassador to Mexico Roberta S. Jacobson to discuss, among other subjects, IU's increased collaboration with UNAM. They also met with top officials at the Mexican Foundation for Education, Technology and Science, or FUNED, an organization that supports the professional development of Mexico's future leaders by helping them obtain advanced degrees at the world's premier universities. Additionally, they held discussions with senior officials at the Consejo Nacional de Ciencia y Tecnologia, or CONACYT, Mexico's equivalent of the National Science Foundation in the U.S. There they explored ways of providing more funding for Mexican students to study at IU and to support more IU students studying in Mexico. Also in Mexico City, McRobbie presided over a successful formal inauguration of the university's new Mexican alumni chapter. IU has nearly 10,000 Latino alumni, including almost 500 alumni affiliated with Mexico. Several of them serve in leadership positions in the country's business, financial and media sectors. "IU has had a long and successful history of engagement in Latin America and in Mexico," said McRobbie, the first IU president to make a trip to Mexico since 1980. "We are committed to strengthening this engagement as a rapidly growing Latino population makes increasingly vital contributions to economic growth, educational development and quality of life in communities here in Indiana, throughout the Midwest and all across the nation. "By pursuing partnerships with Mexico's top educational institutions and deepening ties with our growing ranks of IU alumni in Latin America, we will facilitate greater cultural understanding of this important and growing demographic and creative academic and research exchanges that have the potential to bring substantial and lasting economic benefits to the Hoosier state." According to recent U.S. Census population figures, more than 420,000 Latinos live in Indiana. From 2000 to 2010, Indiana experienced an 82 percent growth in its Latino population, a demographic group that has been increasingly responsible for major levels of economic activity in recent years. Latino purchasing power in Indiana totaled more than $9 billion last year, according to data from the U.S. Hispanic Leadership Institute. The number of Latino-owned businesses in the state grew almost 150 percent over a 10-year period, from 5,482 in 2002 to 13,639 in 2012. Nationwide, there are 55 million Latinos in the U.S., or 17 percent of the total U.S. population, making the Latino community the largest ethnic or racial minority in the nation. According to estimates, this demographic is expected to make up a third of the entire U.S. population by 2050. These trends are reflected in a sizable increase in Latino enrollment at IU, which has roughly doubled over the past decade and is up 5.5 percent from last fall's total. This fall, IU has nearly 6,000 degree-seeking Latino students, representing a new record for the university. Additionally, over the past five years, the number of students from Latin America studying at IU has nearly doubled and now exceeds 400. More than 240 students enrolled at IU this fall are from Mexico. Of the countries that send the most international students to IU, Mexico now ranks fifth. IU has identified Mexico as one of 30 "priority" countries the university is seeking to enhance relations with as it carries out the mission of its international strategic plan. That plan calls for increasing academic and research collaborations -- including faculty and student exchanges -- with Latin America's leading educational and cultural institutions; engaging IU alumni in the region in supporting the university's international engagement and philanthropic activities; and expanding IU's Global Gateway Network through the addition of a new Latin American office to join existing IU offices in China, Germany and India. More than 350 IU students currently study abroad in Latin America, where IU's successful overseas study programs originated. The first formal international study venture organized by IU was a program created by IU’sSchool of Education in 1939, in which an IU faculty member oversaw a summer of travel in Mexico that enabled future teachers to learn more about Mexico and its culture. IU’s Jacobs School of Music, one of the most comprehensive and acclaimed institutions for the study of music in the U.S., is home to the Latin American Music Center, which fosters the academic study, performance and research of Latin American art, popular music and traditional music. Its library has one of the most complete collections of Latin American art music in the world. Earlier this summer, IU Chancellor's Professor of Anthropology Anya Peterson Royce received the 2015-16 Medalla Binniza (Medal of the Zapotec People). The medal is given for distinguished scholarly contributions to the Zapotec people, an indigenous civilization in southern Mexico whose culture dates back several thousand years. She is the first non-Mexican recipient of the award. While in Mexico City, McRobbie was given an official tour of the National Museum of Anthropology, the largest and most visited museum in Mexico. Widely considered as one of the world's greatest museums, it contains one of the world’s largest collections of archaeological and anthropological artifacts from Mexico's pre-Columbian heritage, including the Stone of the Sun (Aztec calendar stone) and the Aztec Xochipilli statue. Across all of its campuses statewide, IU has nearly 9,000 international students who come from about 140 different countries, ranking the university in the top 20 out of about 1,200 U.S. universities in terms of the number of international students enrolled. IU undergraduates can also choose from more than 250 study abroad programs in 17 languages in 52 countries. Around 30 percent of IU Bloomington students will study abroad by the time they graduate. This also ranks the university in the top 20, again out of about 1,200 universities, in terms of the number of students who study abroad. IU also offers instruction in about 80 foreign languages, more than any other U.S. college or university. Among the languages taught at IU are eight languages spoken in Latin American countries.